We are counting down to Valentine's Day over here. A pink holiday all about love?! I'm pretty sure Olivia and I were born for it! :) Now that I've purchased decorations for our place, we are even more excited. Ms. Olivia finally made it out of bed for a short bit yesterday morning so we spent a little time decorating. (With lots more to come!) There are so many cute and affordable options to help dress up your space a little bit to bring some festive cheer for your kids. I'm rounding up a few of my faves below. Don't forget to check out the dollar bins at Target, too. They always have great options. You can see more of her play area in the pics at the end of the post. I just ordered these adorable plates and napkins. It's going to be so fun using them over the next few weeks and again of course on Valentine's Day. This cutlery and sparkle cup would be such fun additions to your table, too. I love this gold balloon and also love these adorable heart balloons. They would be so fun on Valentine's Day morning in their room or at the breakfast table. I really like these letter banners to create your own phrases. They come in a variety of colors and you can order as many sets as you want to create the words you want: Valentine, Love, XOXO, etc. This heart garland is really sweet too and would be perfect in doorways or along the walls at your home. Crepe paper is always an easy decoration to add, too, and this little wreath is made for play kitchens and bedroom doors-- it's too cute! 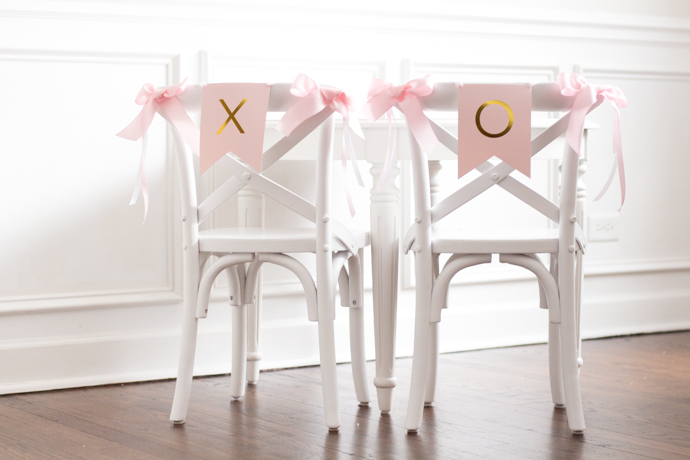 I love these little gold doilies and paper hearts to tape up on the walls, on the backs of chairs and more. We're going to write something that we love about Olivia on each one and hang them on her bedroom door. :) They would also be cute dressed up with some stickers. I love these and these. I hope this helps you get in the Valentine's Day spirit with your babes! It's such a fun holiday to enjoy with them and I think a few easy decorations can go a long way in making it feel even more special. Wishing You A Royal Valentine's Day! Sign up for automatic inspiration! Get my latest posts, fab finds and style guides sent straight to your inbox.